PETER KING: Good morning all. Sarah Thomas was briefly thrust into the spotlight during Monday Night Football. KING: Question from Monday night: On Twitter I praised the line judge, Sarah Thomas, for her call on the goal line on Le’Veon Bell’s game-winning touchdown. Immediately the Twitterverse came back at me for being sexist. 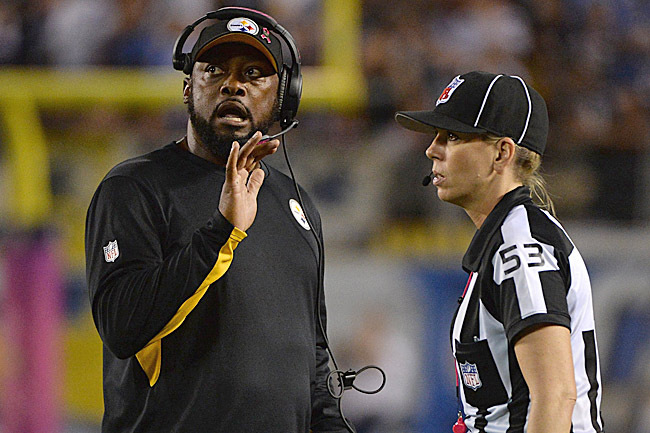 Is it sexist to praise Sarah Thomas for making a good call? VRENTAS: She was hired because the NFL expected her to be able to make the right calls in tough situations. The issue is if she is being praised in the context of being a female official who made the right call, rather than just being an official who made the right call. That comes with being a trailblazer, sure, but what feels sexist is the idea that she has to validate her hire with good calls like that one, whereas male officials get the benefit of the doubt, and are assumed to be competent, until they mess up. KING: Of course. The question is if she makes a good call, is it sexist to praise her? KLEMKO: Whether it’s right or wrong, we know her first big call to end a game is going to be scrutinized because she is breaking down a social barrier. It would be naive to pretend otherwise. I was okay with praising her in this instance. Many singled out Michael Sam for being the first openly gay player to get a sack in a preseason game, and no one blinked. I think the difference, and the reason some slammed you, is that a sack indicates a level of high performance, but a ref doesn’t have that benchmark. Either you’re doing your job or you’re not. BRANDT: It was a big deal that she was reffing the MNF game, thus it was a big deal that she was involved in the game-winning play. KING: Agreed. I think the one problem in cases like this is that we get a little bit too sensitive about issues like this and instead of just saying, Hey good call by Sarah Thomas, and making it a referendum on Sarah Thomas, it’s considered to be an insult because we are not treating her like every other official. The fact is, she isn’t every other official, at least right now. She got a lot of attention for being the first female official, so when she makes her first big call it should get some attention. That was my only point. • AMY TRASK ON SARAH THOMAS: As part of our MMQB 100 series, Trask, the first female CEO in NFL history, looked back at her time in the league and projected what Thomas will face this season. 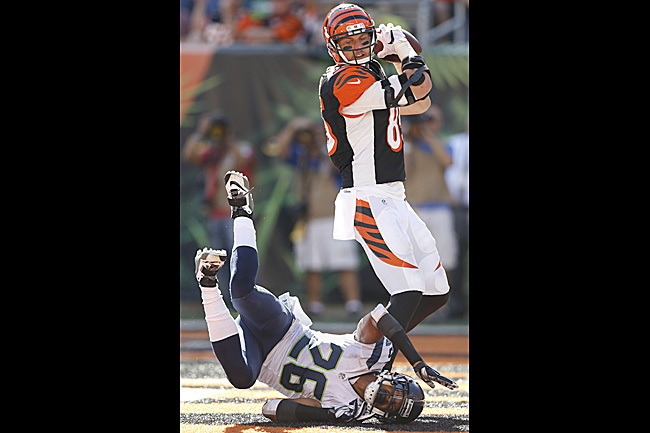 The Bengals picked on Cary Williams early and often on Sunday. KING: Let’s move on. Robert, you covered the Seahawks in Cincinnati. They are 2-3 now. Are they in deep trouble? KLEMKO: They’ve got big problems along the offensive line in pass protection, and I think once the Bengals corrected some overaggression in run defense, they were able to neutralize Thomas Rawls. The biggest problem in Seattle, to me, is the play of Cary Williams at cornerback. He’s a weak link, which Andy Dalton recognized, and he compromises the effectiveness of the rest of the secondary when Kris Richard is trying to compensate. Big trouble? No. They’ll trounce the 49ers twice in the next month. They’re still a playoff team, but far from a Super Bowl pick. KING: And Russell Wilson is the most-sacked QB in football right now. Pass-pro is killing them. • SEATTLE’S TROUBLE ON THE LINE: A porous offensive line is limiting the franchise quarterback and a certain prized offseason addition. The Seahawks aren’t worried, but should they be? KING: Question for all: Who wins on a neutral field today—Seattle or Arizona? KLEMKO: Without Marshawn? Arizona, by a hair. BRANDT: Since it’s “today” I would say Seattle. I always prefer a good team coming off a tough loss than a good team coming off an easy win. VRENTAS: Arizona. They’re averaging 38 points per game. Can’t see a vulnerable Seahawks defense—getting back to Robert’s point about Cary Williams—containing that offense right now. KING: Andrew, you covered the league meetings last week, and I sense the league is at a crossroads with the Los Angeles decision. What’s the best guess as of today where the three teams in question end up—Rams, Raiders, Chargers? BRANDT: It certainly is a crossroads, and I remember my first league meeting, in 1999, where one of the key topics was—you guessed it—L.A. Now we have three teams angling to move and two shining stadium proposals in L.A. Too early to tell, but my sense is that all three will apply for relocation when the period opens in January; then it will be up to ownership and politics. I think Spanos has the votes to block Kroenke (they need 24 out of 32) and Kroenke has the votes to block Spanos. This will be a watershed moment for Goodell to “manage the outcome.” Lots to come in months ahead. KLEMKO: Is the biggest question which would be the most viable team in that market? How do you judge something like that? Does it come down to stadium resources? Owner capital? Quality of the ball club? Existing fan base? BRANDT: Combination, but key is stadium plan—or lack thereof—in the home team market. It was telling that the “home team market” presentations were made not by the teams or by the cities, but by the NFL; and the L.A. presentations were made by the owners of the home team markets! San Diego [ownership] does not like the city’s plan at all. St. Louis ownership is dying to get to L.A., and Oakland city officials have no plan. St. Louis will be the tough one: Does Kroenke try to move even if the city/state step up? And what do the owners do if that happens? • THE NFL WANTS L.A., BUT DOES L.A. WANT THE NFL? : This summer, The MMQB’s Emily Kaplan spent time in Los Angeles to gauge just how much of an appetite L.A. has for an NFL team. 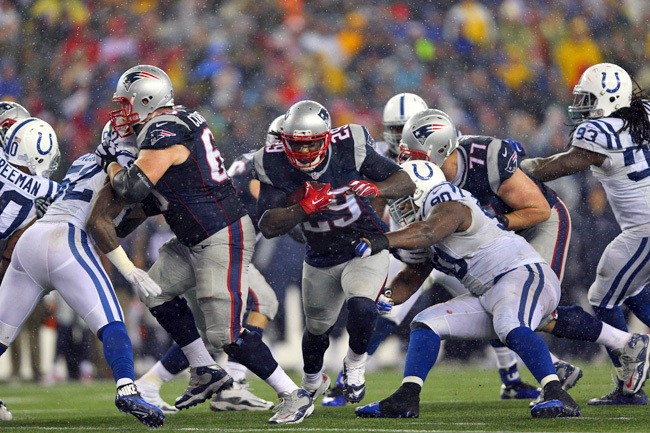 The Colts had no answer for LeGarrette Blount in the AFC title game. KING: Next topic: Colts-Patriots Sunday night. Knowing the characters involved on both sides, who do you think is under the most pressure in this game? I say Chuck Pagano. He’s got to show that his defense is making the strides from the one New England has steamrolled three games in a row. VRENTAS: I’ll go with Ryan Grigson. Being able to stop the run, and being able to run the ball to control the tempo of the game, start with having the personnel to do so. Has he built a team that is more capable this year of beating the Patriots than the one blown out twice last year? KLEMKO: Andrew Luck. Will he play or not? This could be one of those career-defining moments for him. You only get so many shots at Tom Brady. 3-3 in that division wouldn’t be cause for concern, but a win over New England in the first half of the season sets you on a special course. BRANDT: Colts seem to have regressed since they were blown out by New England in January. This is their moment. Having said that, they can win that division playing poorly all year. 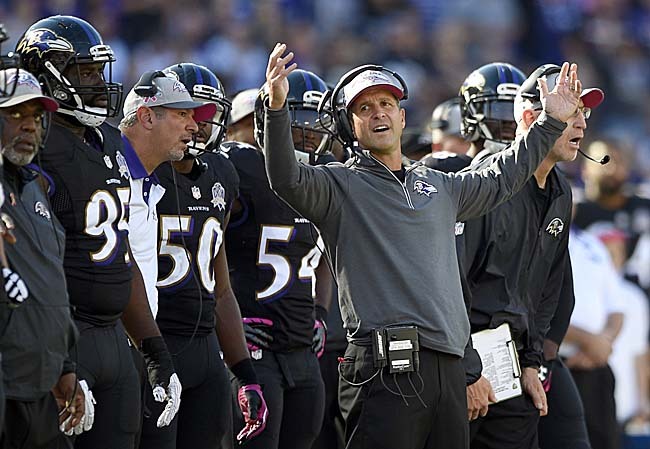 A heartbreaking loss to Cleveland knocked the Ravens down to 1-4. KING: Are the Ravens finished? Incredible that they’re four games out after five weeks. I think they’re too beat up. My one X-factor with Baltimore, though, is that they’ve always shown that they are not afraid to do something before the trading deadline, and they’ve got lots of ammo if they want to go out and get a receiver, a good one, before the deadline. But my Green Bay-Baltimore Super Bowl pick is looking grim. Thoughts? VRENTAS: And the Ravens have always been a tough team, able to rally because they are a sturdy franchise with a well-built roster. But I just don’t think they can this year. Two losses are looming large: Terrell Suggs and Gary Kubiak. Never underestimate the havoc losing a linchpin of a defense and a good offensive coordinator can have on a team. KLEMKO: Your Super Bowl pick! All I know is, Steve Smith is the only starting-caliber wide receiver on that team, and the tight ends are talented but young and their inexperience shows. The Steelers with Roethlisberger will beat this Ravens team at their best 8 out of 10 times. • STEVE SMITH SR.’S LAST LECTURE: Writing for The MMQB, the star receiver looks back on lessons learned, the legacy he’ll leave behind, and why he doesn’t fear what’s next after his retirement from the NFL after this season. A meeting in Santa Clara might be inevitable. KING: Last question: What’s the most compelling story in the league right now? My opinion? It’s the fact that the Bengals might not be the Bengals anymore. They might actually be a clutch team that could be a major roadblock for the Patriots in January. Anybody else? VRENTAS: To me, it’s Peyton Manning. I never expected to see a Peyton Manning-led team with a No. 1-ranked defense and a No. 30-ranked offense. That defense has carried the team to its 5-0 record, masking the question no one really wants to answer: Is this the end of the road? Maybe he’s still adjusting to Kubiak’s offense. But it’s more likely that his play dips in the colder months than resurges. The best remedy right now, for all parties, is to get that run game going, because the Broncos won’t be able to count on pick-sixes to score every week. KLEMKO: Take a look at the NFC South. A year ago, one of the worst divisions in recent NFL memory. Today, the top two teams are a combined 9-0. I felt good about the Falcons when we visited that camp; a lot of coaching talent with Dan Quinn and Kyle Shanahan. Here’s what I didn’t foresee: a running game that would take pressure off Julio Jones and balance the offense. And Carolina? I had them going 3-13. At 4-0, they’re a prime example of the tackle position decreasing in value and importance in today’s NFL. Apparently you can win with a quarterback and a couple of solid guards. • BELIEVE IN THE BENGALS: Cincinnati is 5-0 for the first time in Marvin Lewis’s 13-year tenure. Pessimists will still point to the franchise’s recent playoff futility, but the true measure of growth isn’t just wins and losses. 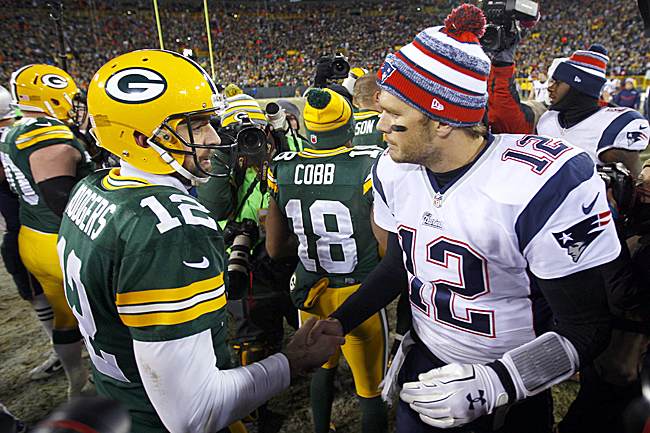 KLEMKO: Peter and Andrew have already brought up the Super Bowl. Jenny, if you could revise your pick right now, who represents the AFC and NFC? KLEMKO: I’ll go out on a limb and say Falcons-Patriots. The two weeks between championship and Super Bowl sobers up the Falcons and they get trounced. • Follow The MMQB on Twitter. Email us at talkback@themmqb.com. The NFL Wants L.A., But Is It a Requited Love?